Welcome to an Amateur/Ham Radio News updated from Big Island ARRL News. Content provided by HQ ARRL, 225 Main Street, Newington, CT, 06111. Following “The ARRL Letter”, I’ll repost Joseph Speroni’s (AH0A) message about the new ARRL EMCOMM Course. Accessed on 28 March 2019, 2200 UTC, Post 914. Apple has released a new app for digital QST (version 5.1) for digital readers that use iOS devices. A long-standing problem involved the inability of some Apple iOS app users to download digital QST issues to their devices. When they attempted to do so, the app crashed. The new app is now available on the Apple iTunes store. Apple also required ARRL to create a new version of the app that allows non-members to purchase individual issues of the QST digital edition. Amateur Radio Emergency Service® (ARES®) volunteers in Colorado stepped up as a mid-month “bomb cyclone” winter storm struck the state, with heavy rain shifting to heavy snowfall. The storm affected several states and led to significant flooding in Nebraska. Parts of Colorado recorded winds of nearly 100 MPH and record-low barometric pressure readings. ARES teams in Colorado began preparations a day ahead of the so-called “bombogenesis” weather event. 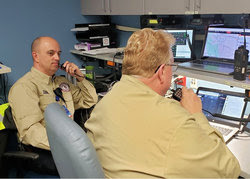 Pikes Peak ARES alerted its personnel via email and a regularly scheduled Tuesday net and coordinated with the Special Communications Unit (SCU), a special cadre of radio amateurs in the Pikes Peak Regional Office of Emergency Management (OEM). Most SCU members also belong to ARES, but when called up by the OEM, they wear their SCU hats. The SCU planned to deploy to the Emergency Coordination Center (ECC) on March 12 and be ready to operate first thing in the morning. At the time, the Red Cross did not anticipate needing Pikes Peak ARES support, so the ARES district planned to undertake weather spotting for the National Weather Service (NWS) office in Pueblo and relay status information to the ECC. By the morning of March 13, however, the storm’s timing had changed, and the Red Cross requested ARES operators in four shelters, creating a problem with recruiting and deploying sufficient volunteers in time. Three ARES volunteers were identified, but by then the weather was so severe that only one was able to get through, amid difficulties. At the request of NWS Pueblo, a formal weather net was called up and ran for more than 10 hours, even though the primary and back-up net control stations lost power for several hours. Some 70 operators provided reports during the storm and its aftermath. An informal net continued for another 16 hours until the SCU operators were released from the ECC. “While the net started out as a weather net, it quickly became a common way for operators to report stranded motorists, requests for assistance, abandoned vehicles, Good Samaritan rescues — important so that the ECC could clear police, fire, rescue, and National Guard units from responding — shelter status, and requests about road conditions,” said John Bloodgood, KD0SFY, Pikes Peak ARES Emergency Coordinator and Public Information Officer (PIO). The storm stranded more than 1,000 motorists in El Paso County. Neighboring Douglas and Elbert counties also took proactive measures on March 12, opening emergency operations centers (EOCs) in anticipation of the storm. Both counties count on ARES of Douglas and Elbert Counties (ARESDEC) radio to support communication in emergencies. Before the heavy rain turned to snow, the two counties had already begun to open shelters. The ARES team’s operations staff closely followed weather forecasts and knew this activation would be different. As the storm progressed, it became clear to county officials that additional shelters would be needed. ARESDEC operators assisted the Red Cross in setting up shelters and organizing and managing food service. “WSPR” is the topic of the new (March 28) episode of the “ARRL The Doctor is In” podcast. Listen…and learn! Tad Cook, K7RA, Seattle, reports: During the March 21 – 27 reporting week, solar activity increased while geomagnetic indicators were lower, compared to the previous 7 days. This is a nice combination for the first week of spring. Although sunspots and solar flux decreased toward the end of the period, average daily sunspot numbers doubled from 8 to 16, and average daily solar flux increased from 70.7 to 75.2. Average daily planetary A index decreased from 8.1 to 3.7, and average daily middle latitude A index decreased from 6.3 to 3.9. These numbers are all good, because higher sunspot numbers and solar flux suggest better enhancement of the ionosphere, while the lower geomagnetic numbers correspond to generally lower absorption or disturbed conditions. The planetary A index is a composite from magnetometers around the globe, but the middle latitude A index is from a single magnetometer in Virginia. 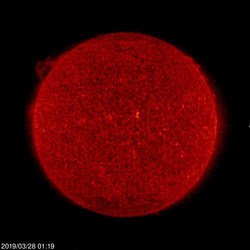 Predicted solar flux from the March 27 forecast is 68 on March 28 – April 3; 70 on April 4 – 6; 71 and 74 on April 7 – 8; 75 on April 9 – 18; 74, 73, 73, and 71 on April 19 – 22; 70 on April 23 – May 3; 71 and 74 on May 4 – 5, and 75 on May 6 – 11. Predicted planetary A index is 18, 12, 8, and 5 on March 28 – 31; 8 on April 1 – 3; 5 on April 4 – 11; 15 and 10 on April 12 – 13; 5 on April 14 – 21; 8, 12, 12, 8, and 8 on April 22 – 26; 5 on April 27 – 28; 8 on April 29 – 30; 5 on May 1 – 8, and 12, 8, and 5 on May 9 – 11. There were no sunspots on March 26 – 27. Sunspot group AR2736 appeared on March 23, then disappeared. Sunspot numbers for March 21 – 27 were 49, 27, 22, 14, 0, 0, and 0, with a mean of 16. The 10.7-centimeter flux was 80.1, 82.4, 79.4, 75.4, 71.2, 69, and 68.9, with a mean of 75.2. Estimated planetary A indices were 2, 1, 1, 3, 5, 6, and 8, with a mean of 3.7. Middle latitude A index was 2, 2, 2, 3, 5, 5, and 8, with a mean of 3.9. A comprehensive K7RA Solar Update is posted Fridays on the ARRL website. For more information concerning radio propagation, visit the ARRL Technical Information Service, read “What the Numbers Mean…,” and check outK9LA’s Propagation Page. The 3Y0I DXpedition to Bouvet Island (Bouvetøya) is off, at least for now. The skipper of the MV Atlantic Tunadetermined it was not safe to continue its voyage to the remote Antarctic island after the vessel suffered some damage from severe storm conditions. The DXpedition had expected to arrive on the island on March 26 and be on the air by month’s end. “The captain of the MV Atlantic Tuna had to [m]ake a difficult but responsible decision to take a course back to Cape Town, South Africa,” a March 27 news release said. “But the 3Y0I Expedition is not cancelled — we don’t give up that easily.” The DXpedition’s press officer, Stan Strzyzewski, SP8S, said he’d had a “long conversation” with DXpedition leader Dom Grzyb, 3Z9DX, who reported that the seas had calmed enough to permit crew members to inspect damage caused by a “severe cyclonic storm” on March 26 when the vessel was some 70 nautical miles off Bouvet Island. The ship was hit by waves of more than 36 feet and winds exceeding 100 MPH. Wind conditions near Bouvet Island. The black X (to the right of the orange dot) indicates the approximate location of the MV Atlantic Tuna on March 27 at 0630 UTC. Once back in Cape Town, the team will reassess its plans and decide whether to attempt a return voyage to Bouvet in April or to postpone the DXpedition for next season. 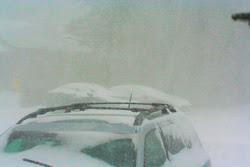 Ohio ARES members stared down “Snowmageddon” 2019, the mid-January blizzard that blanketed the lower Great Lakes region. Based on ominous forecasts and discussion with Assistant Section Emergency Coordinators (SECs) across the state, Section Manager Scott Yonally, N8SY, and the Ohio Watch Office, SEC Stan Broadway, N8BHL, asked ARES operators to provide observations and reports to assist decision makers at the Ohio Emergency Operations Center and county emergency management agency centers. “We could do this safely from our homes, and integrate our reports (remotely) into the state’s WebEOC management system, which could be read by the Ohio Watch Office and any other emergency official around the state,” Broadway said. Broadway said emergency managers around the state were impressed that Amateur Radio could furnish reports with such detailed information. He said HF capability to reach across the state was a proven asset, with effective communication in all directions. In a recent issue of QST, Steve Ford, WB8IMY, took a look at the forgotten Digital Radio Mondiale (DRM) system. Digital broadcasting was supposed to be the life preserver for international shortwave broadcasters facing the reality of rising costs and shrinking audiences. In 1998, broadcasters, equipment manufacturers, regulators, and others formed the DRM consortium to create a specification for digital shortwave broadcasting that might stem the growing shift to internet broadcasting and revive listener interest. DRM promised an FM-quality signal that also could convey text information such as program titles and news headlines. DRM signals heard on a conventional AM receiver sound like wide-band noise. The DRM signal carries three separate channels — a primary audio channel, and two subsidiary channels, one for essential decoding data and a third service description channel. Unfortunately, DRM failed to halt the decline of shortwave broadcasting; it was too little, too late. In addition, consumer electronics manufacturers lacked enthusiasm for the new format, so an audience for DRM never coalesced. Some international HF broadcasters still use DRM on a regular basis. The list includes the BBC, Radio France International, and All India Radio. Decoding a DRM signal is far easier today than it was a decade or so ago, and the rise of software-defined radio (SDR) has provided new avenues for DRM listening. Many SDRs specifically include DRM as a reception mode. Radio amateurs early on experimented on HF using DRM-derived software called WinDRM. Much has changed over the intervening years, and today the HF digital voice application of choice is FreeDV. If you hear buzzing signals at 14.236 MHz, chances are it’s a FreeDV QSO. For more information on this topic, see “Eclectic Technology” in the April 2019 issue of QST (p. 65). 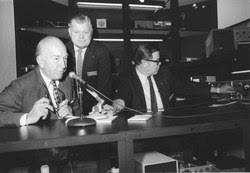 Smithsonian Secretary S. Dillon Ripley (left), then-ARRL President Harry Dannals, W2HD, and operator Joseph Fincutter, W3IK, inaugurate NN3SI in July 1976. NN3SI will operate mobile and portable from several District of Columbia, Virginia, and Maryland locations on most bands and modes. NN3SI hopes to be on the air for most contests this year including Rookie Roundup, the ARRL June VHF Contest, and ARRL Field Day, Weise added. As he recounts, NN3SI was initially a temporary “special” call sign granted to the Smithsonian during the US bicentennial in 1976, and the station remained active until 2008 when building renovations left NN3SI without a permanent location. Astronaut Chris Hadfield, VA3OOG, speaks to students from NA1SS in 2013. ARISS says enthusiasm sparked by a school contact has led to an interest in ham radio among students and to the creation of ham radio clubs in schools. 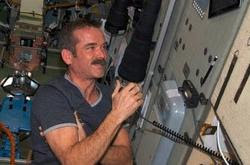 Some educators have even become radio amateurs after experiencing a contact with an ISS crew member. ARISS is looking for organizations capable of attracting large numbers of participants and integrating the contact into a well-developed, exciting education plan. Students can learn about satellite communications, wireless technology, science research conducted on the ISS, radio science, and any related STEM subject. Students learn to use Amateur Radio to talk directly to an astronaut and ask their STEM-related questions. ARISS will help educational organizations locate Amateur Radio groups who can assist. The deadline to submit proposals is May 15. Proposal webinars for guidance and questions will be offered on April 11 at 7 PM EDT (2300 UTC) and on April 16 at 9 PM EDT (0100 UTC on Wednesday, April 17). Advance registration is required. More details, such as expectations, proposal guidelines, and the proposal form, are on the ARISS website. Medtronic, the world’s largest medical device company, has acknowledged that many of its implanted cardiac defibrillators use an unencrypted wireless protocol that could let an attacker change the device settings. The Department of Homeland Security’s Cybersecurity and Infrastructure Security Agency (CISA) has assigned the flawa vulnerability score of 9.3 — near the top of its 10-point scale. It said the flaw makes it possible for an unauthorized party to read and write any memory location of the implanted devices. At issue is the Conexus radio frequency telemetry protocol, which is used as part of its remote patient-management system for communicating between defibrillators, home monitoring devices, and clinician programming devices. According to CISA, affected devices include the MyCareLink Monitor, CareLink Monitor, CareLink 2090 Programmer, and other Medtronic implanted cardiac devices listed in its alert. The primary vulnerabilities are improper access control and transmission of sensitive information. The CISA alert goes on to say, “Medtronic has applied additional controls for monitoring and responding to improper use of the Conexus telemetry protocol by the affected implanted cardiac devices. Additional mitigations are being developed and will be deployed through future updates, assuming regulatory approval. Medtronic recommends that users take additional defensive measures to minimize the risk of exploitation of these vulnerabilities.” These “additional defensive measures” are spelled out in the CISA alert. NCJ — National Contest Journal. Published bimonthly, features articles by top contesters, letters, hints, statistics, scores, NA Sprint, and QSO parties. QEX — A Forum for Communications Experimenters. Published bimonthly, features technical articles, construction projects, columns, and other items of interest to radio amateurs and communications professionals. Subscribe to the ARES E-Letter (monthly public service and emergency communications news), the ARRL Contest Update (bi-weekly contest newsletter), Division and Section news alerts — and much more! The ARRL Letter is published Thursdays, 48 times each year. ARRL members may subscribe at no cost or unsubscribe by editing their Member Data Page as described at http://www.arrl.org/arrlletter/.